I know that it’s hard to believe but we are halfway through this college football season as we roll into the first week of October. This is no time to reminisce about autumn or the sunny slopes of yesterday. It’s time for the Red River Rivalry or as the fine people in the Republic of Texas and the State of Oklahoma like to say…..
That is until the sun went down across the horizon and ironically enough, as the sunlight disappeared so did my weekly average. 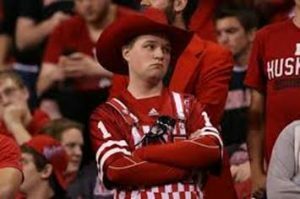 The CFB Wizard went 53 and 12 or 82% last week and overall after five weeks in this college football season stands at a rather dismal 284 and 65 or 81%. I think I have identified the problem in my lack of Prognostication as of late. The past several mornings when I first awoke…. I am amazed at your prognostication skills and your ability to foresee the outcome of so many games on the schedule, it’s quite remarkable to say the very least. But as a registered clinical psychologist I am fascinated with your thought process. If I may ask you one question, what are you thinking this very moment? I am thinking that anyone that walks into Home Depot, Lowes or other hardware store and wants to purchase just one single brick is VERY suspicious. What’s your take on an early bowl line up??? I’m curious to know what you think! A: Typically the “Big” New Years Bowl games will take care of themselves, but at this time of the season it’s important to examine the lesser tier bowls as they are often a springboard into the next season. That being said my early bowl predictions for three bowl games….. This bowl game will be reserved for two teams that have been about as enjoyable to watch this season as Flint’s water is to drink. I know, I know, it’s probably going to be minus 50 degrees when the game kicks off, but the fans of the respective schools can smell the coconut oil from the suntan lotion and dream of the days when they played bowl games in warmer climates. A: Pete thank you for the well crafted and articulate email. I would however make one slight suggestion….. Please do something about the picture that you have associated with your email. The high shirt collar and lack of a descriptive Adams apple in the picture leads one to believe that you are a transvestite and also do something about your hair because you look like a cross dressing Cher impersonator. I just finished reading your book; I didn’t buy the crap my girlfriend got it for me. You are straight up high dude if you believe in all that God and Christian stuff. Haven’t you ever heard of “Evolution”? You know, like when the earth was formed by a collision of asteroids and rocks in space? Have you EVER heard of “Science”? A: Despite the name calling you bring up an interesting theory Marty…. Go out in your yard or wherever and find a good size rock, a sturdy one, you know one with some mass to it. Now loosen up and then go back outside and grasp the rock firmly and start bashing the crap out of your 2002 Ford Focus until it turns into a Mercedes AMG Roadster. Let me know how that turns out for you…..
A WORD FROM THE CFB WIZARD…….. 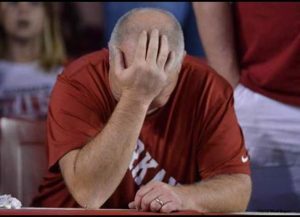 Many once proud programs are suffering through dismal seasons already and the evidence of such can clearly be seen on the faces of the alumni, fans, coaches and players. 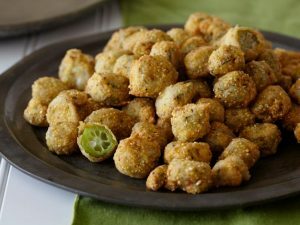 My Beloved Delta State Fighting Okra who have won innumerable conference championships and a number of National Championships have found their Okra not something to be “Feared” as their motto goes by “Fried” as they are currently 0 and 5 and most certainly will be 0-6 after they tangle with Valdosta State this weekend. 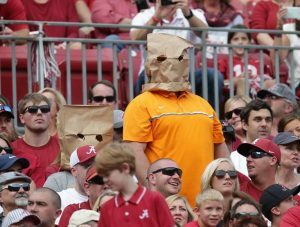 Lastly, I think it’s important to remember for the Alabama, Clemson, Georgia and Ohio State and other such fan bases that nothing lasts forever. Much like life itself, there are the ebbs and flows of life just like there is in college football. So while other teams may and are struggling for now, keep your humility about you. Nothing lasts forever, so enjoy your success now without being too prideful. Although both schools are in the same “Time Zone” respectively…..
It’s still not Tulsa Time, if you know what I mean….. The Birds are down and the Rambling Wreck is just that….. There is no finer place to see a college football game than Huntington West Virginia in the Fall of the year……. This is one of the many games within the State of Donny and Marie that is played for the coveted “Beehive Boot” which quite frankly I don’t understand. Have they never been stung on the foot, ankle or calf muscle by a damn bee? Spoiler alert: It hurts like hell! This game will be closer than you might think…. The Red River Rivalry, in Dallas Texas…….. I wish I had established a used furniture store in Morgantown years ago…. I would have more money than Ernest Tubb by now. I don’t feel particularly good about this pick….. This Old Big Ten (Whatever the number is this week) Conference Rivalry is played…. Although Tulane’s “new” helmets and uniforms looks like a drunken idiot from Hanna Barbera cartoons designed them as a joke; I will still go with….. It is the cold and flu season so I cannot in good conscience pick a school named after a pesky cough. Sorry…. That one whole day of fall felt wonderful in Big Sky Country….. Although Bye is a ten point favorite this Saturday…. Unlike past seasons I am convinced that they will kick enough field goals to win…. The Panthers are playing more like house cats these days…. Ole Harding has been on roll this season….. I don’t know if it’s an “Upset” or not…..
Do you remember when this one game decided everything in the college football world? Wasn’t that a Disney movie? Despite the odds against them in this game….. I have some difficulty picking the “Golden Flashes” because it gives me a horrible image of naked people running amok at the assisted living facility. The first “Big” game for the Commander in Chief’s Trophy …. It’s going to be close…. Although my allegiance is with South Alabama….. The Bronco’s best not take this game lightly…..
And that my friends is….. Please the game description above….. The fact they there is a school to “train” Marines in the art of commerce is abhorrent to me, they should be out killing something, NOT counting out change at a damn register. I know you have been waiting on this rivalry game! This Big Ten (Isn’t it twenty six or something?) Conference rivalry is played for…. Who the Hell names their college after a rock? That’s some real imagination you folks have there…. I’m not the only one that has noticed how luscious Wynonna Judd’s back hair glistens in the glow of the stadium lights as she leads the team onto the filed in Boulder. I have on good authority that she “may” be the new spokesperson for the Animal Planet. I hope Ole Monroe spends that check from Ole Miss wisely…..
“IF” this game was played in Dallas I would feel differently. I wish I cared but I really don’t….. In the immortal words of Lionel Richie and the Commodores…. Not sure where I was going with that one…..
My Black Lab “Doc” won’t forgive me for this pick…. I am attempting to make up with “Doc” with this pick…. I have a feeling that Liberty’s freedom will be taken from them in this game. Its been said that the month of October is “Make it or Break” time for teams…. This will be the best game on television “if” you are still awake on Sunday at one in the morning on the East Coast. Unless you like those infomercials, then maybe it’s not. That sounds like a horribly creepy nightmare after a night of dollar margaritas…. Your Week 7 College Football Picks should arrive on schedule next week on Thursday, just have you have come to expect, that is unless the Delta State Fighting Okra stage the upset of the century and in that case I will be in line for a liver transplant at Wal Mart. It’s next to the automotive section in case you were wondering…. Although there isn’t a new story on Mikerights.com this week as time and events somehow got away from me the past several days, it doesn’t mean that I don’t appreciate you reading the stories and letting me know what you think, because I do truly appreciate it. Enjoy Your games and be good to one another and yourselves.